I’ve never read an Atwood and I was disappointed. I will read more so you Atwood fans can take your seats again. Perhaps this is not her best. That’s not to say the writing was bad at all. Not so. I just wish she’d spent less time creating elaborately detailed characters and more time breathing life into her repetitive formula. As I began, I liked the way Atwood has thought about the four main characters a huge amount. She really knows their lives, what motivates them and why they’ve come to be where they are. This makes them work very well. They’re very believable, very real people. Little throw-away lines put you in a position to see things the way they see things. This is what kept me going through the nearly 700 pages of this book. Like most books I read written by women, I learn a lot from seeing the world through a woman’s eyes. But there’s a certain amount of desperation in each which I found hard to relate to. Don’t misunderstand me, I know that each of us has childhood issues which colour our adult life. I myself didn’t have the most pleasant childhood at all. But am I the only one who doesn’t spend each waking day looking over my shoulder at my fears trying to ensure that the door to the closet with my skeletons in it stays well and truly shut? In this novel I was! Now, if this had been the influence of one woman on another and the resultant emotional and psychological fallout resulting, the novel could have been two-thirds the length and no doubt a great read. Quite why there should be three repeated plots with the only variation being the neuroses of the particular victim concerned I’m not sure. Perhaps Atwood had a list of traumas on her desk and realised that to pack them all into one character would be like resurrecting Hamlet. Or is everyone in Toronto really like this? It’s this ‘law of thirds’ which made the novel overlong for me. There are three characters plagued by a fourth. You meet the three in the same order. Atwood introduces them in the same way with each introduction bringing them to the same conversation with each other. Then she’s off again and we’re taken on a biography of each of the three, in the same order, with the same resultant connection of their lives. As if she hasn’t exhausted the formula enough, Atwood then does it all over again. The nemesis is confronted by each of the three, again in the same order and again with the same resultant conjunction of fates. All too labouriously predictable for me. Oh yeah. And then the one who’s made their lives a misery for all these years goes and… well I won’t spoil it for you by telling you what happens because I don’t know. And neither will Atwood. She doesn’t even bother to tell you. Finally, she won no gold stars for a glaring error slap dab in the middle of the book: Jesus was an only child apparently. The story of Zenia ought to begin when Zenia began. There’s clean outside and there’s clean inside. peplum: Short skirt sewn on to the bottom of a fitted bodice. Then she opens the door, and goes in to join the others. I am continually fascinated by this book. One of the many things that I enjoyed about it is the mood that Atwood created; I could feel the atmosphere as intensely as I could in Tartt’s “My Secret History”. What did you think of Zenia? Do you think that she represents the part inside of us which destroys what we want most? Can you picture her as the embodiment of sin? That’s what she represented to me. 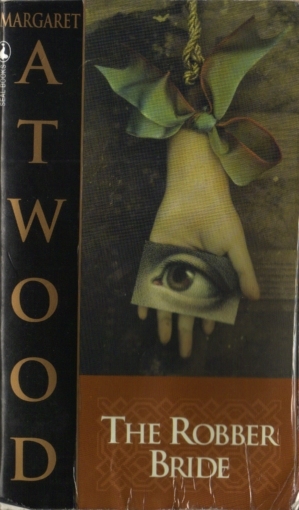 I haven’t read this, but I loved The Blind Assassin, if you want to give Atwood another go. I’ve also read The Handmaid’s Tale and the ss collection Dancing Girls, but I wasn’t very impressed by either. So, as a non-Atwood fan, I still adored The Blind Assassin! I’ll keep in mind your opinion re Thousand Acres. I put it on the list kind of hesitantingly (I go to college in the Midwest, and I rather detest the region, so I don’t really like reading books set here), so I think I’ll just go ahead and bump it off. Plus, who really wants to read about children being sexually abused by their father? @ Bellezza – Zenia for me was never fully fleshed out. I wondered at times whether she was actually just a shared schizophrenic image that the three women’s fears conjured up a la Beautiful Mind. I don’t see how she is the “embodiment of sin” because sin is the result of our own desires. Perhaps however, she was the result of the desires of the men that were seduced, desires that were not satisfied in their relationships with the three main characters. We’re all as bad as each other absolutely. It just seemed to me that Zenia was not quite human, perhaps not fleshed out because she wasn’t human, as much as an evil “force”. I wish I could be more articulate, it’s been several years since I read it. I just have always felt that she was a force/spirit/darkness which was bent on destruction. The very fact that she wreaked havoc with all three women who were her friends let me think she’s not so much real as the part in the world which causes pain and failure. I like the little additions you add to your reviews — the words list and the first lines. Very nice! The only Atwood I’ve read is The Handmaid’s Tale…..and I loved it! I do have Cat’s Eye on my TBR challenge list though! Nice review, but I’m sorry you were disappointed with it! @ Imani – glad you like the additions. I’ve decided to try to add a couple more little sections from my next book on. Culture – points I pick up about culture I didn’t know and Location – hopefully I can link to a Google Map outline of the locations the book is based in… have to grapple with a bit of tech for that! Great blog! I found you through the Blogroll Game & will be subscribing to your feed. This is one of my favorite Atwoods, though it’s been ages since I read it. I thought your review brought up some good points and I’m curious to see whether or not the book holds up for me. This is not one of my favorites, but in general, I love Atwood immensely. The thing about Atwood is that each book is so incredibly different in style that you could actually hate one and love another. Other writers I feel this way about are T.C. Boyle and Jane Smiley. They don’t stick to one genre or voice or … anything. I think my favorites are The Handmaid’s Tale, which is a dystopian novel; Cat’s Eye which is a sort of bildungsroman about friendship and isolation and how cruel people can be to each other; and Alias Grace, which is a historical mystery type of story, based, I think, on a true event. If you like sci-fi, there’s Oryx and Crake. She also writes poetry, short stories and essays if you think you’d prefer those. She’s very versatile! I really loved this book and prefered it to Handmaids (I didn’t get on with the ending). I could find something in all the characters including Zenia that I could related to and it really struck a cord with me. You know, I’m not really a fan of Atwood either. My first was The Handmaid’s Tale which I enjoyed but since then, the others I’ve tried such as Bodily Harm haven’t done anything for me. It’s a shame because I own about seven of her books now!